Most cricket fans would get attracted to a product promoted by their cricket hero, Sachin Tendulkar. Although I'm not crazy about cricket, I did buy a packet of Sach Orange beverage recently. Fortified with vitamin C and calcium, it's ingredients are water, sugar, orange juice concentrate, calcium citrate, ascorbic acid, etc. The product also contains permitted flavors and natural colour. Nutrition label says that for every 100 ml of the beverage, we can expect approx 55 calories, 13 g sugar, 33 mg calcium, 75 mg of vitamin C.
Calories seem a bit on the higher side for 100 ml juice coming out of a carton. Sugar is adding to the increase in calories. Also at 13 g in just 100 ml, one serving of 200 ml juice would give 26 g of sugar which is the entire day's requirement of sugar for an adult! Good amount of vitamin C in a serving. We can get similar amounts of vitamin C and calcium from other natural foods. 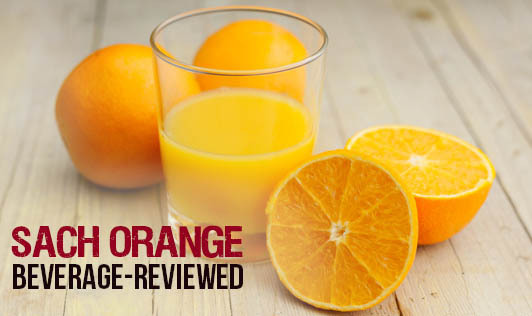 There are other carton orange beverages without sugar and colors added. Given a choice between eating an orange, drinking a glass of fresh orange juice and drinking orange from a carton, I would go in the same order of preferences! The price compares well with other carton beverages sold here. So, what is the USP of this product? Sachin, of course!